Airwolf Extended Themes track list, listen to music teasers, find out how it was created and learn about the people behind the brand new 2CD soundtrack for the mid-1980s TV series. The original Airwolf Themes music 2CD soundtrack & digital re-release. StarFleet Soundtrack from the Airwolf Themes producers. 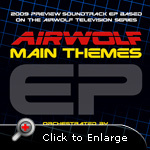 ‘AIRWOLF THEMES’ is a 2CD soundtrack album score, later joined by a sequel preview EP called 'AIRWOLF MAIN THEMES' EP, with a further expanded official 2CD sequel released during March 2014 called ‘AIRWOLF EXTENDED THEMES’, for the high-flying, mid 1980s, American, action adventure, television series called 'Airwolf' (1984-1986) which starred Jan-Michael Vincent, Ernest Borgnine, Alex Cord, Jean Bruce Scott and Deborah Pratt. What made the episodic music so different to other peer television shows of its day like 'Knight Rider' was that both composers, Sylvester Levay and Udi Harpaz (and the other stand-in composers Ian Freebairn-Smith and Bernardo Segáll) utilized a more "tune-of-the-week" approach to their episodic scoring for Airwolf's music score (used in addition to the show's Main Theme Tune every week) rather than the bland, background, orchestral music score traditional to shows of the 1970s + 1980s by their contemporaries, that today are very difficult to listen to the music in their own right without all the dialogue, visuals and foley sound effects layered on top. Airwolf's legacy is that the music, and especially the Airwolf Main Theme Tune stands out simply due to that so-called, tune-of-the-week approach to the music score which transports you to specific scenes, in specific locations, in specific Airwolf episodes, from specific seasons of the show – giving a very unique selling point and quality that makes these collections of Airwolf Themes, especially ‘Airwolf Extended Themes’ or ‘Airwolf Main Themes EP’ such an enjoyable escape to both synthesizer and orchestral music aficionados. The Main Theme song itself really is a piece of iconic music that has transcended above its original intention and stood the test of time by being known by millions of people around the world, both young and old, as the traditional tune (compared to 'Blue Thunder') to sum up the entire, high-flying world of helicopters and some will even say, some of the greatest synthesiser music ever created, especially from the pioneering days of the mid-1980s. How many of you have the Main Theme Tune song on your mobile or smartphone like an iPhone or Google Android cell phone especially? A lot of you we'd bet. Well, both the ‘Main Themes EP’ and the new 2014 ‘Extended Themes’ 2CD release have now begun the defacto recordings from the series. So make sure you update your old Mono recordings that you have now, with the real thing from this website. The original ‘Airwolf Themes: 2CD Special Limited Edition’ shipped during February 1999 to those who had reserved them six months beforehand, mostly ‘Airwolf Appreciation Association’ members, although afterwards remaining copies shipped to many other countries purely from direct sales over the internet. Only 1000 copies were ever made. It was later re-released and re-mastered in Summer 2007 as a Digital Downloads only AAC / MP3 release via Apple iTunes and Amazon, and later via 7Digital.com. It is currently unavailable as it's between digital distributors at present. 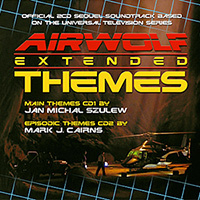 This was a 4-track prequel release in 2009 to show the progress on the bigger 'Airwolf Extended Themes' album of which these four music tracks have now been integrated. 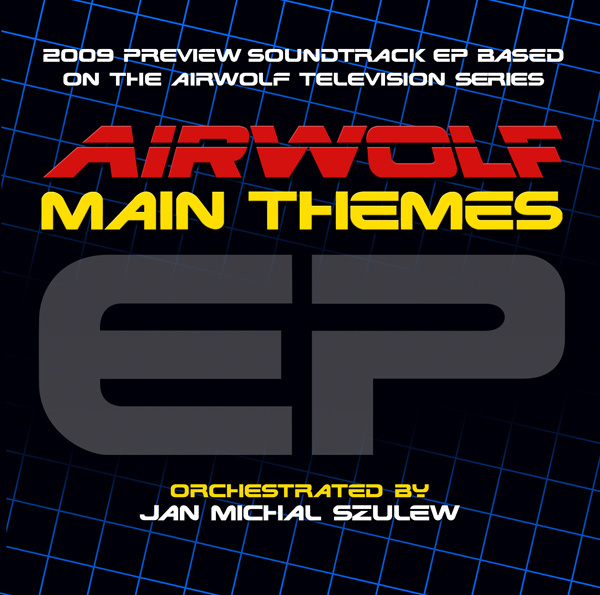 Released via online digital distributor, 7Digital, it provided an initial vehicle the talent of Orchestrator & Associate Producer, Jan Michal Szulew to show the Airwolf fans that he could perfectly recreate certain main themes from the TV series, including a brilliant combination of the aerials from Season 2 episodes, 'FALLEN ANGEL' and 'HX1', as well as other longer variants of the show's theme song originally composed by Sylvester Levay. 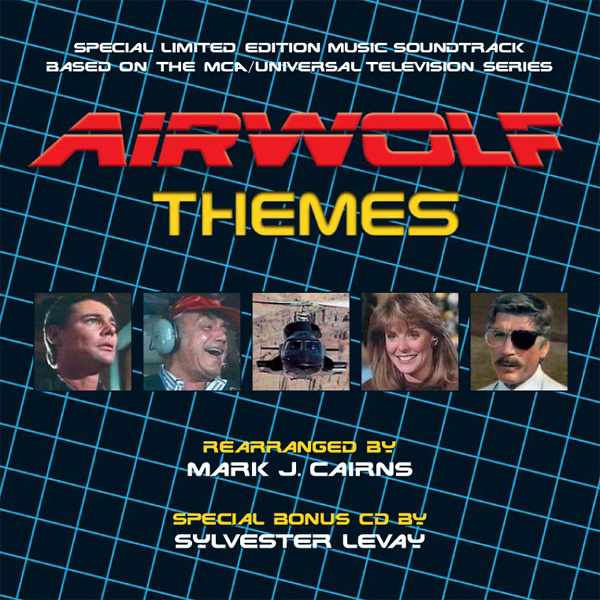 Released at the end of March 2014, five years after the prequel release for 'Airwolf Main Themes' EP, the full-length 2CD album features music from the original three CBS aired episodes from the show, with the first CD "Main Themes" featuring 22 brand new recordings of variants of the Main Theme song performed and producer by Orchestrator & Associate Producer, Jan Michal Szulew; and the second CD "Episodic themes" by producer, Mark J.Cairns concentrating on the non-Main Theme works by Levay, Harpaz, Freebairn-Smith and Segáll.